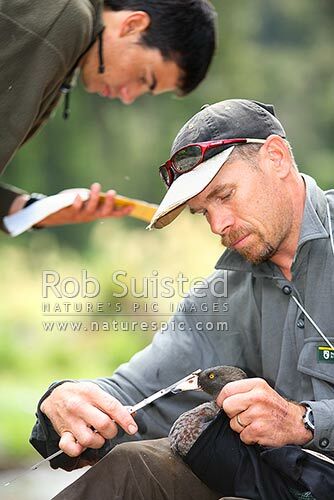 Andrew Glaser (DOC, Opotiki) measuring a wild blue duck (Whio (Hymenolaimus malacorhynchos). Tim Allerby taking notes. Te Waiiti River, Te Urewera National Park, Western Bay of Plenty District, Bay of Plenty Region, New Zealand (NZ), stock photo.